You are probably going to hear a lot of talk about Adolis Garcia‘s pinch-running stint last night as metaphor for the second half of the Cardinals’ season. That’s because it’s about as apt as anything baseball can throw at you. In the eighth inning, with two outs, Matt Carpenter drew his second walk of the game and was replaced with Garcia. That’s not a bad move at all but it is a bit surprising that they did it while Carpenter was still at first and while Jose Martinez was still in the game. Martinez had had his own base-running issues and a defensive one as well, but stayed in the game and came up to bat here. Martinez hit a nubber to third and Mike Moustakas threw a ball that bounced and got away from Travis Shaw. In some ways, it seems fitting that the Cardinals would have their playoff hopes basically killed by a baserunning unforced error. Garcia then compounded the problem by not only not going back to third but also giving up on the play. Perez’s throw to Erik Kratz came in so much ahead of Garcia that Kratz swung around to tag him only to find Garcia not even in the neighborhood. An alert Garcia might have been able to get around the catcher being off-balance and looking the wrong way, but Garcia seemed resigned to the out and ran into an easy tag. 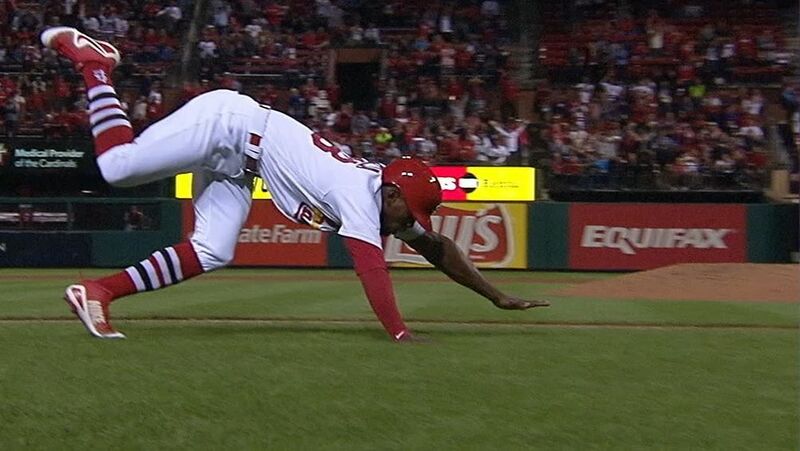 So, to spell it out, like the Cardinals under Shildt, they took off, blasted through the middle of the trip, then fell on their faces down the home stretch. Yesterday, we talked about how this team didn’t give up but there was only so much they could give right now. If that’s the case the tank is completely on empty now. To be fair, the last time they faced Jhoulys Chacin, they mustered just four hits in six innings. Back in June, though, they’d gotten to him for eight runs in 4.1 innings. They could hit Chacin at one time so perhaps he’s made adjustments, perhaps it’s just the Brewers’ year, or perhaps there’s nothing left. Last night, the Cardinals were set down in order the first time through the lineup and that ball hit by Martinez that started the wild scamper was their second–SECOND–and last of the night. Carpenter drew two walks and Marcell Ozuna drew the other one, plus Paul DeJong was hit by a pitch. When we look back at this season, something it seems we’ll be able to do come Monday, we might think about how things might have gone differently had bases-loaded situations been more fully capitalized on in the final month. We remember Martinez having three such situations in a short proximity and striking out, hitting into a double play, and getting an RBI groundout in them. Jedd Gyorko had two such situations on Tuesday night and came up with the bases loaded and one out in the fourth last night. (The Cards didn’t get much offense but they did cluster it well.) A base hit there gives the Cardinals the lead and maybe starts a chain reaction. While a sac fly is obviously good–it tied the game–it’s a little underwhelming. There’s nothing like seeing “In play, run(s)” in that situation, only to find out it was just a sacrifice fly. I’m going to give the Hero tag to Carlos Martinez. Two scoreless innings with four strikeouts, though he did put two walks on the board in the ninth. If the Cardinals were going to come back–something they almost did–they needed that boost. Martinez is looking like he could be a starter now, though there definitely is a difference in a two-inning stint versus preparing for six or seven, and if nothing else there should be no real health concerns for him over the winter. The pitching staff on the whole did pretty well. John Gant gave up a run in the third when he walked Christian Yelich–something Cardinal pitchers did five times last night–then gave up base hits to Jesus Aguilar and Shaw. Overall, though, 4.1 innings with four hits and three walks isn’t spectacular, but it is a lot better than what a lot of starters have brought to the table recently. The other run came when Chasen Shreve, who had just replaced Gant, walked Yelich and then gave way to Dakota Hudson, who got burned by a two-out flare from Shaw that just got over the infield. You know it’s not your night when balls hit well, like Kolten Wong‘s drive to the wall or the liner that was smoked by Ozuna that Shaw snared and turned into a double play, are caught while flares drop for RBI singles. The Goat? Anybody on the offense could about be a target. The Phillies’ first eight batters of last night’s game struck out and they still had a better offensive performance than the Cardinals did. We’ll go with Harrison Bader, who went 0-3 and struck out twice. The only saving grace was that, with the lack of baserunners, he never struck out in a big spot. The Cardinals have been eliminated from divisional contention and, with the Rockies winning and the Dodgers losing, right now they trail LA for the last wild card spot by a game. The Dodgers, who lost the last two to the Diamondbacks, have today off as well before going to San Francisco to finish the season. Given how things went last time the Cardinals were in this spot, I don’t think you can trust LA to help and you can definitely trust San Francisco to hurt. Usually that’s by winning but that would help this time, so expect a Dodgers sweep even if the Cards can manage to do the same to the Cubs. No, most likely winter is coming. Try to enjoy the next three days of baseball. All of them are day games, so the nights of watching baseball are over. Hopefully the Cardinals have a few more moments left in them before we close the book on 2018!